I went as a Reptile Man costume. I came up with the idea because I wanted to do something different and kind of scary that could pass for cinema quality, only without the cost. I made the costume starting with bendable plumber’s pipes. I inserted smaller and smaller pieces into each other to create the tail. Next, I took clay and created all the horns for the whole costume, and the tail. I glued these to back boards and the tail, and then painted them to look pretty realistic. Next, I took the tail and bolted a belt to it, so I could actually slip it under a pair of biker shorts. The end product with the tail looked pretty good — you could not tell how it was attached. Then I shaved my head, taped down my ears, taped on all the body horns, and covered everything in liquid latex. This ensures that the tape edges can’t be seen and makes the paint adhere better. Once the horns were all in place, the tail attached, and a rough covering of paint was in place, I started on my face. I cut the end off of some child’s fishnet tights, and pulled it over my head, cutting out the area in the front for my face. This created a “scale head and neck” look. I added the horns to my head, and then glued a facial prosthetic mask. I bought this, but heavily modified it, adding horns, cutting off the neck, and resizing it. Once that was in place, I used lots of latex to merge the area where it attached to my head so it was harder to tell that it was glued on. I added the contacts and teeth, which were also purchased online. I then put on a pair of fishnet tights, a fishnet shirt, and some fishnet gloves, which were all also painted to fade out the edges and look more reptilian. The feet and hands were also made by me, mostly using clay, glue, and duct tape. The finally product was fairly comfortable and I think it looks pretty good too. I hope you like my Reptile man costume. Thanks for the great website and great ideas. By the way — I was the “gargoyle” submitted last year… It’s great to see it up on the site! Your costume and video are brilliant! Great job. The video is a crack up!!! That’s a very nice costume! I love the tail! I think it was a nice effect to use the fish netting to imply scales, how did you end up attaching the horns? Did you end up putting holes in them to be sewn to the body suit – or did you use some uber-glue? Sorry I get too curious – between the photos and the videos the costume just fascinated me – Keep up the amazing work! What a creative and amazing costume! I loved the costume and the video, with the music had me hoping my husband wouldn’t come up behind me and put his hand on my shoulder (even though it’s broad daylight)…I would have jumped out of my skin. Very, very creative–don’t stop !! The part where you walk across the road as the reptile guy scared me. Awesome job man! Where did you get those teeth? They look amazing. I am in awe! I can’t believe how amazing your costume is! And it’s homemade!!! This costume takes the cake! One of the best homemade costumes I have ever seen!!! GREAT JOB! being the terror of every child’s dreams in my neighborhood including my own children,,,you truly need to get into the movie business as a special effects artists, you are no doubt , a true genius…freaky scary and excellent all in one, SIMPLY PUT YOU ARE TRUE TALENT AT ITS BEST….. 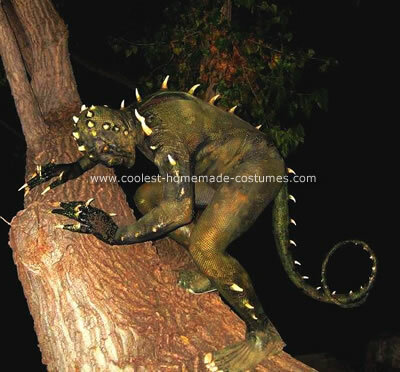 I saw your gargoyle costume too – freakin unreal! I just wanted to thank everyone for all the kind words! I?m humbled and honored that all you would take the time to comment about my costume. It was a lot of fun to create and wear. I?m currently working on my latest creation — a werewolf — complete with homemade digigrade stilts (designed to add about a foot of height plus mimic the retrograde leg style of wolves) — and lots of hand sewn fur. It?s my most ambitious costume yet, so I?m keeping my fingers crossed that it?ll work out. I?ll be sure to send in pictures of it once it is completed. Again, thank you all for the comments. I really am overwhelmed that so many people took the time to leave messages. Good luck to everyone and have a Happy and Safe Halloween! Hey, Austin, I was wondering if you had directions or a watered down “how – to” for this because I was considering making a movie with a lizard creature! This is BEYOND PERFECT. Wow best costume I have ever seen! I’m going to be that this Halloween. Its going to be fun cuz we are dressing up for band at this Fridays football game. Alex, I’d be happy to send you some photos of how I made the costume and give you more info. Contact me through my youtube page – austinwdavidson – or just search youtube for “reptile-man attacks” and send me a comment there. Or you can email me at impishrogue@hotmail.com. I’d be happy to give you any help I can. That video seriously was scarier than BLAIR WITCH, and your costume (including the gargoyle) is phenomenal!! Many kudos to you!! Sorry it took me awhile to respond — I just happened to see your post today. As far as your question, if you plan on painting latex over your ears, I’d suggest being really careful. 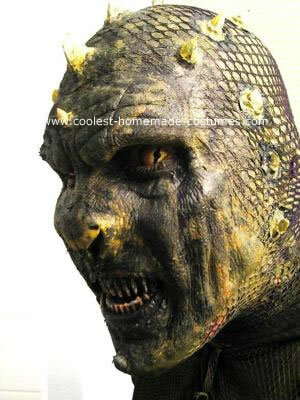 When I made the reptile-man, I basically duct-taped my ears down around the edges but left an opening to hear out of. I avoided the opening while painting the liquid latex on. Consequently, I could hear just fine. A little black and green paint totally covered the little bit of pink skin showing. I wouldn’t recommend painting any liquid latex directly over the ear. Not only will it block your hearing somewhat, but it will be uncomfortable and probably pull lose on its own–not to mention that it could even be dangerous if some trickled in your ear canal. I’m not a doctor, so I couldn’t say for sure, but that would be my opinion. Remember that you can always paint over the top of latex, so if you really need to cover your ears, just use the latex around where you really need it and then switch over to body safe paint. 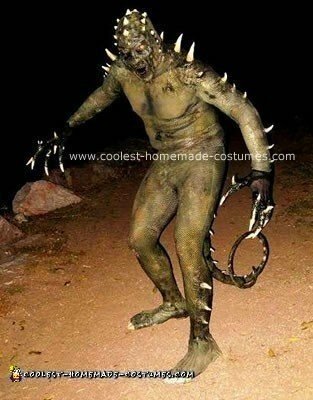 I’d very much like to mimic this costume of yours, but perhaps more fishman style than lizardman. I have a couple of questions. What kind of clay did you use for the spikes and such? Are you wearing a full-body suit, or is your skin just painted? Is this a one-time costume, or is it possible to wear again after it’s taken off for the first time? Also, how long would you say you spend on this outfit before you finished? wow i saw all ur three costumes just wanted to say that you are extremely talented!! !… your costumes amaze me …. keep up the good work n u should even consider pursuing a career in this…. your very creative!!! Your costume combined with your sense of theatrics is phenomenal. You belong in Hollywood. Our Theatrical Rock Band “Passion For Power” will be performing our Rock Opera “Death Of The Illuminati” for a “Live” video stream Pay-per-view in March 2012, then possibly on to a world tour. We would be honored if you were to let us use some of your film footage in one of our “Live” videos. I am so impressed! It’s wonderful to see such creativity. Loved the film too. Thank you. 1. how did you make the feet and hands? 2. how did you polish the horns? You may even be my hero now! LOL! Way to go Austin. You can come Trick-Or-Treating at my house any year!